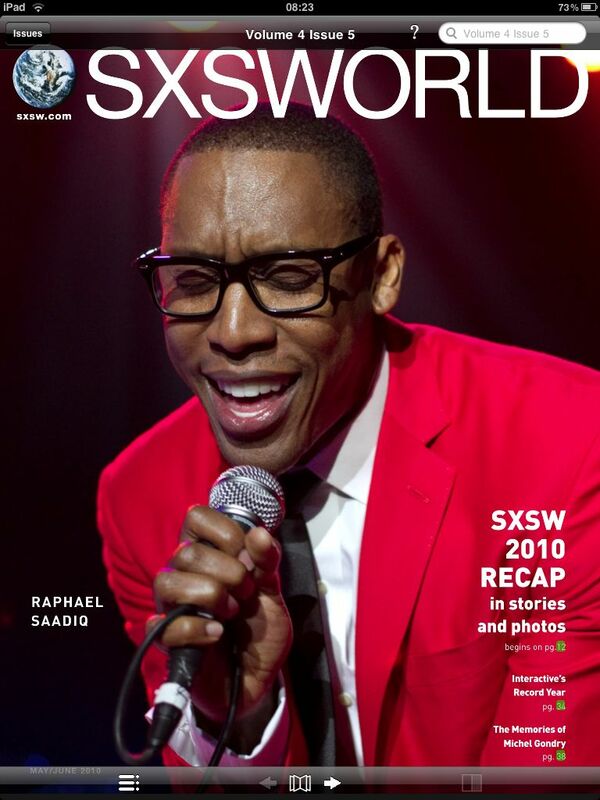 SXSW World is the second magazine to use the Exact Editions iPhone/iPad app platform for free distribution. Dazed & Confused was the first. 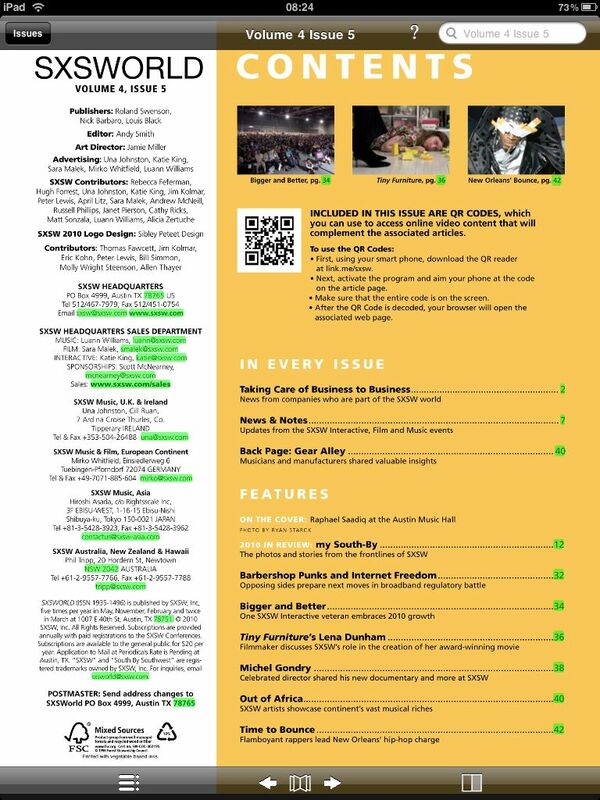 Again, we draw attention to the interactive links highlighted in green on the digital table of contents page (zip codes, email addresses, urls, as well as page numbers are highlighted). The iPhone, since it is a phone, will also present the phone numbers as highlighted for click-to-call. The grouping of three icons at the middle of the tool bar at the bottom of the window are for moving through pages. 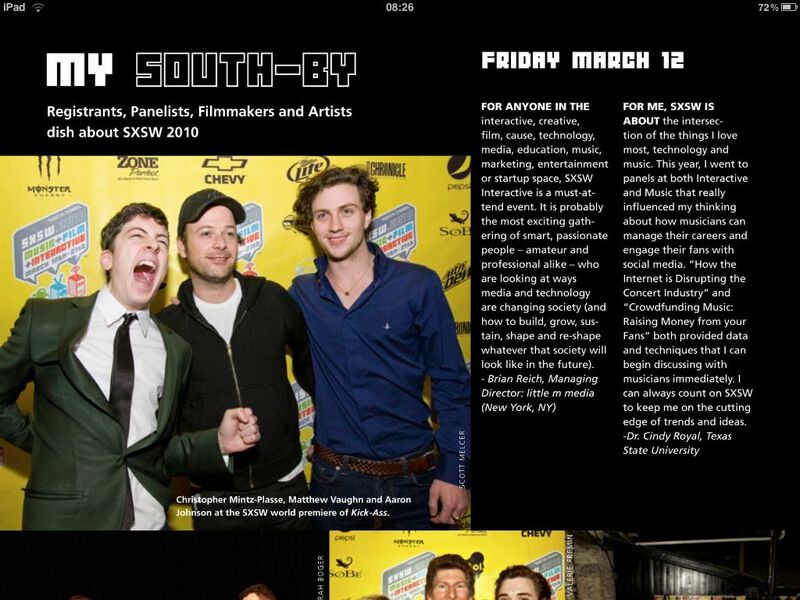 Naturally the arrows are for moving right or left, and the left arrow is ‘greyed out’ in this snap because we are at the front cover of the magazine. Sorry there is no way that you can go left here! The open book, or concertina, icon in the middle is perhaps the most powerful of the navigational tools in the set we offer. 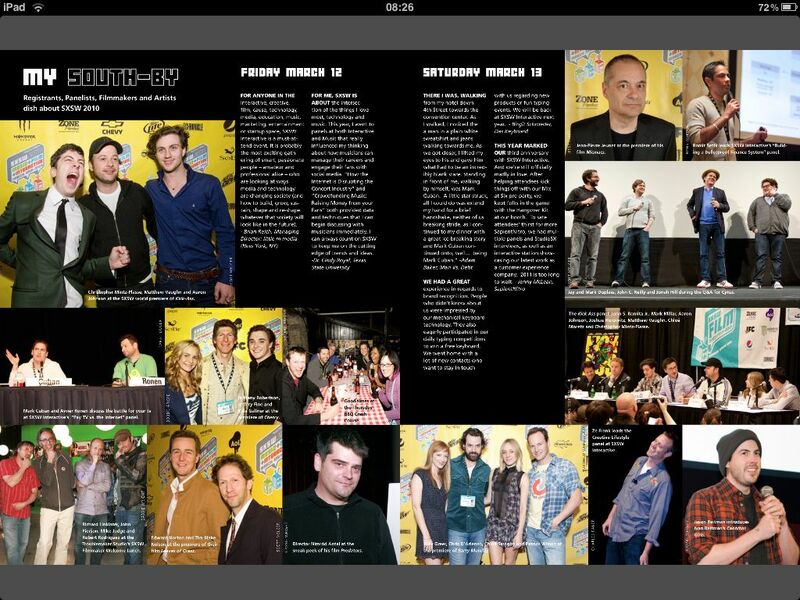 It opens up a quick browse view of the magazine, which we call ‘PageFlow’, which is in some ways similar to the iTunes ‘Coverflow’, but rather more ‘page-y’, since it shows pages in recto and verso views as you move through the publication (naturally, by sliding your finger over the stream of pages). 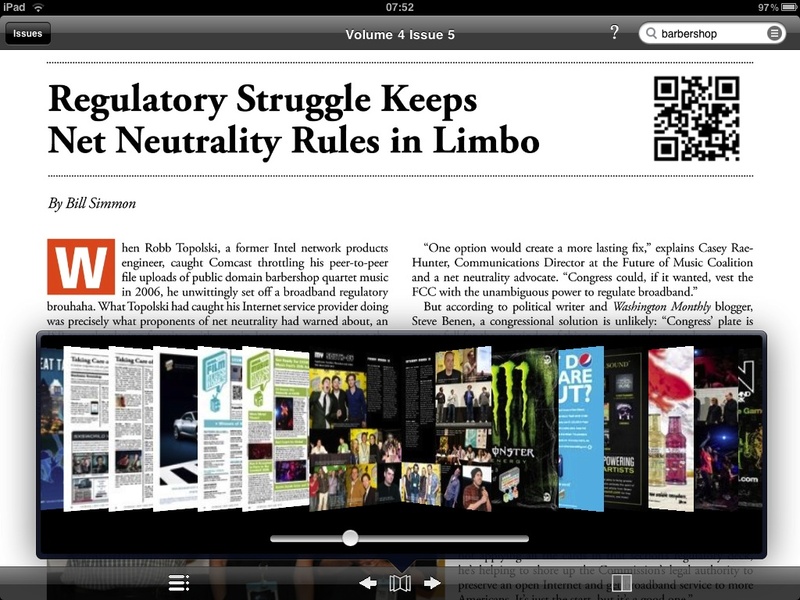 PageFlow is so blisteringly fast on the iPad that this soon becomes a very valuable way of controlling and navigating the magazine as a virtual object. The slider bar with its bead (to be picked up and slid along the bar) is streaming through the same underlying PageFlow, but even more quickly, and this is especially useful for really large volumes. 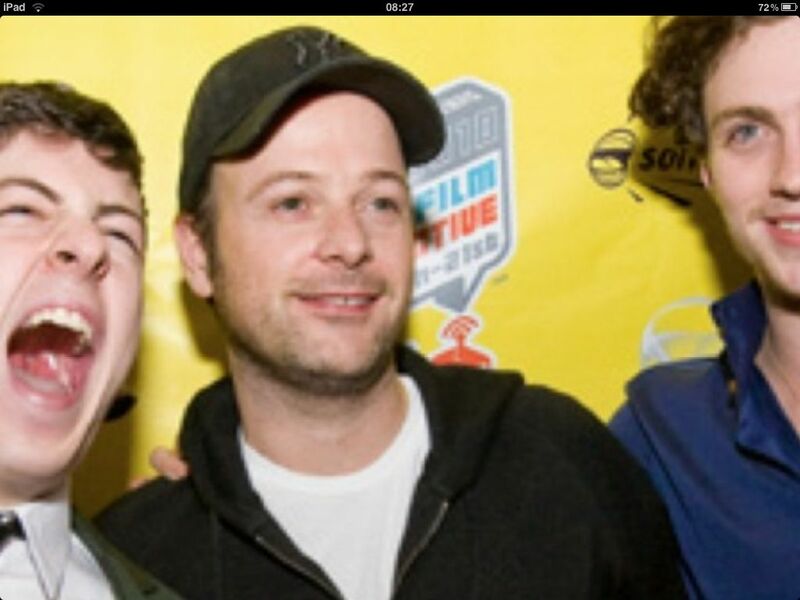 I am not sure that we need to see Matthew Vaughn in higher resolution than that! The last icon on the bottom tool bar is to alternate between double page and single page views. We have only covered the controls that are available from the bottom tool-bar. Next time we shall cover the set of controls that come at the top of the page.